Mars Rovers Extended - Solar System Planets And Moons Section. Mars Rovers' contracts extended for a third time. NASA has given Spirit and Opportunity rovers up to another 18 months to continue rolling around the surface of Mars in search of evidence of past water. The rovers have already completed their primary 3-month missions, and then an additional 11 months of extensions. Both rovers are still in surprisingly good shape, and are approaching targets that would have initially been considered out of reach. Opportunity set a new driving record on March 20, completing 220 meters (722 feet) in a single day's drive. "The rovers have proven their value with major discoveries about ancient watery environments on Mars that might have harbored life," said Dr. Ghassem Asrar, deputy associate administrator for NASA's Science Mission Directorate. "We are extending their mission through September 2006 to take advantage of having such capable resources still healthy and in excellent position to continue their adventures." Opportunity is within a few football fields' length of a region called "Etched Terrain," where scientists hope to find rocks exposed by gentle wind erosion rather than by disruptive cratering impacts, and rocks from a different time in Mars' history than any examined so far. "This is a journey into the unknown, to something completely new," said Dr. Steve Squyres of Cornell University, Ithaca, N.Y., principal investigator for the rover's science instruments. To reach the Etched Terrain, rover planners have been pushing the rover fast. Opportunity has overtaken Spirit in total distance driven. It has rolled more than three miles - eight times the original goal. 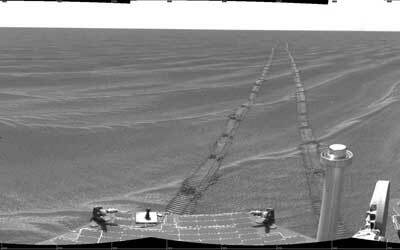 On March 20, Opportunity also set a new martian record of 722 feet in a single day's drive. Drive-distance estimates can vary by a few percent. The long drives take advantage of crossing a plain so smooth it's "like an East Coast beach," said JPL's Jeff Favretto, mission manager on the Opportunity shift in recent weeks. Also, Opportunity's solar panels, though now dustier than Spirit's, still generate enough power to allow driving for more than three hours on some days.